Did you know that you can tell what muscles an organism used most in their life from studying their bones? When scientists studied the skeletons of ancient archers, they were able to determine their archery methods by understanding what muscles they used most. Skeletons of 9th and 10th century CE warriors in the area of modern Hungary showed activity-induced stress markers on their bones, also called musculoskeletal stress markers. These bow-wielding warriors had unusual bone structures in their collarbones, upper arm bones, and lower arm bones -- in other words, where crucial archery muscles are attached in living humans. Shoulders: Anterior deltoids for holding the bow, posterior deltoids and infraspinatus for drawing. Back: Latissimus dorsi, trapezius, rhomboids, and the teres major and minor muscles all assist in drawing. Arms: Biceps and brachialis for drawing, triceps and brachiordialis for holding. Okay, that's a lot of muscles. it's a fairly unique combination that not every athlete or experienced gym rat experiences. Many an archer has heard an anecdote of a body builder friend attempting to properly draw a bow and struggling. An Olympic archer can burn an estimated 1,084 calories while winning a gold medal, and as The Economist points out, many other Olympic events are beat out in calorie burn by doing just ten minutes of chores or Wii Fit. 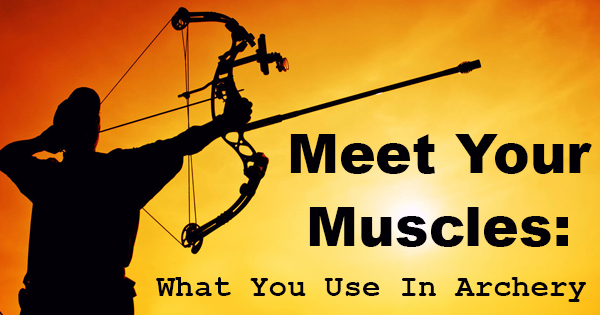 Of course, the range of muscles being intensely used in archery is exactly why archery strength training and bow trainers are important. Injuries and chronic pain are not uncommon in professionals and frequent hobbyists. Relieving common archery shoulder pain and joint swelling is a complicated process. Training slow and steady can help you avoid those kinds of injuries in the first place. Look into proper archery training aids to make sure you're safely building up your own muscles. Who knows, maybe someday in the far future a scientist will marvel at your muscly arm bones.